It’s common knowledge that the transition from David Akers to Alex Henery hasn’t gone smoothly. After all, Henery’s two missed field goals against San Francisco were a big reason for that loss. But much less ink has been shed over the change at punter, where Chas Henry replaced veteran Sav Rocca. Back in August I crunched the numbers on Rocca and the rest of the punters in the NFL in 2011, going beyond simple net punting averages to factor in situational field position. That study showed that Rocca wasn’t elite, but he placed above average among his peers in almost every category. Using the same parameters as last time (please read that one for an explanation), I scored Henry’s punts through his first six games. At right you can see all of Henry’s punts, with punt distance, return yardage (including touch backs), and the difference between the actual and optimal results. It’s a small sample, but we can start to draw conclusions. For starters, although this isn’t shown in the table, 16 punts is an exceptionally low number. The Eagles offense has actually punted fewer times than any other team in the league. Leading the NFL in turnovers helps with that. 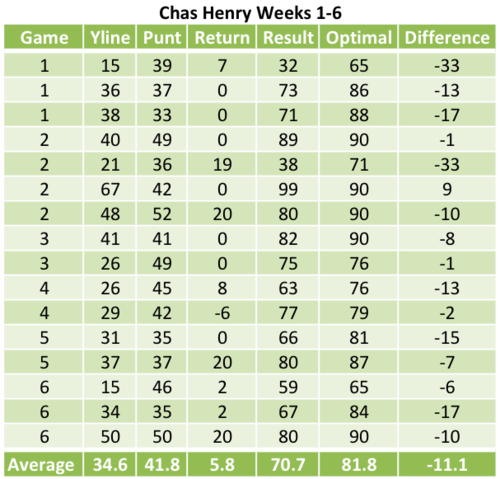 Second, Henry’s punts have not had the distance of a league average punter. Among players with at least 10 punts, Henery is 27th with a 41.8 yard raw average. That has been his biggest problem so far. Despite allowing fewer big returns, Henry’s average difference from optimal is almost exactly the same as a rookie punter from last season: the Giants’ infamous Matt Dodge, who ranked 33rd among punters. There is some cause for optimism, however, if you are inclined to grant Henry the benefit of the doubt on his very first NFL start. Of his five worst punts this year, three came in that first game. Since then, Henry hasn’t been good (or even average), but his -8.8 yard difference from optimal would put him closer to 20th in the league. Hopefully Henry can continue to improve, before he becomes a liability like his fellow rookie specialist.